On June 26, 2006, my bus to work didn't show up and I was inspired to write a blog about it. And six years, 1467 comments, nearly 6000 comments and some 800,000 views later, it's still going. If that's a surprise to you, it's definitely a surprise to me. Just Up The Pike has given me the opportunity to meet dozens, if not hundreds, of awesome people making a difference in our community. I hope I've made a few friends as well. However, there's one person without whom this blog may have never happened. Kevin Keegan approached me during my junior year at Blake High School about writing for the Blake Beat, the student paper. I was skeptical at first. I already had Ceramics as my elective and was looking forward to honing my skills on the throwing wheel. However, Mr. Keegan suggested that my talents were better spent behind a keyboard, so I enrolled in his class mid-year. I learned about picas and column inches, interviewing sources and fact-checking, and how to tell a story in 400 words. I absorbed the Blake Beat stylebook and read columns by John Kelly, now a columnist for the Post, from his days in Mr. Keegan's class at Rockville High School in the 1980's. In the fall of my senior year, I was appointed Opinions Editor and got a regular column. Not only could I write about things that mattered to me, but people actually read and responded to what I wrote, which I still find exhilarating today. Mr. Keegan sought out the brightest kids at Blake for his staff, and he took us seriously. We enjoyed a lot of control over how the paper was run, but also had the responsibility of producing a superior product each month. From spending evenings in paste-up assembling the next issue to having long, spirited arguments about the proper use of a semicolon, work at the Blake Beat was challenging but always fun. 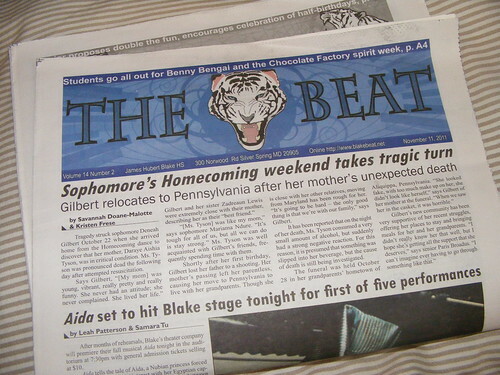 As a result, the Beat has been named one of the best student newspapers in Maryland and the country for over ten years. Rumors of Mr. Keegan's retirement have been swirling for just as long, it seemed. But every time I returned to Blake, he was always in his office and willing to shoot the breeze. On my last visit this spring, Mr. Keegan told me he was finally retiring after 34 years and moving to Massachusetts. I already said it then, but I'll say it again: Thank you, Mr. Keegan. I never learned how to make a bowl, but you taught me how to work on a team, how to think critically, and how to ask questions. I'm not sure JUTP would've happened had I not been part of the Blake Beat. Or, at least, it would've been a lot worse.